Description: Located in Venice, 219 yards from Teatro La Fenice, 40.17 SAN MARCO features air-conditioned rooms with free WiFi throughout the property. One of our best sellers in Venice! Located in Venice, 650 feet from Teatro La Fenice, 40.17 SAN MARCO features air-conditioned rooms with free WiFi throughout the property. Each room is fitted with a flat-screen TV with satellite channels. Certain rooms include a sitting area for your convenience. Enjoy a cup of coffee from your terrace or balcony. The rooms are equipped with a private bathroom equipped with a bathtub or shower. For your comfort, you will find free toiletries and a hairdryer. St. Mark’s Basilica is 1,650 feet from 40.17 SAN MARCO, and San Michele Cemetery Island is 1.1 miles away. The nearest airport is Marco Polo Airport, 5 miles from the property. The design and decoration of the room is nice! Room and bathroom is clean. Appreciate of the compliment drinks and coffee! 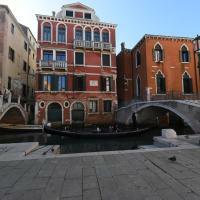 The property is located in the prime San Marco neighborhood, a short walk to the Piazza San Marco and Accademia Bridge. The room was spacious and very clean and comfortable and well worth the price. Beautiful room, very luxurious. Loved the freebies, drinks, snacks, and toiletries. Hotel room was comfortable. The price included juices etc from minibar. Location is excellent. The room had plenty of space and was well decorated. Excellent central location. Very comfortable and high standard. Good info. Pretty much everything great but see below. Great bar nearby on way to/from Rialto. Friendly and reasonable prices. More on Trip Adviser. The location of the hotel was fabulous. Easy to find every time. The staff were also great – they showed me where to catch the vaporetto that I needed to get to the places that I wanted to go to and they gave me great advice on restaurants. Hotel A La Commedia is just 215 yards from the Rialto Bridge and the water-bus stop, and only a 10-minute walk from St. Mark’s Square. Its terrace features romantic views of Venice. Featuring free WiFi throughout the property, Accademia Charm Apartments is located in Venice, just 382 yards from Teatro La Fenice. St. Mark’s Basilica is 0.4 miles away. Located in the San Marco neighborhood in Venice, 547 yards from St. Mark’s Basilica, Ad Place Venice features a terrace and views of the city. Guests can enjoy the on-site bar.